The warrior women of Eriana Kwai are the island's last hope of gaining freedom from the dangerous mermaids who have slain the men before them. 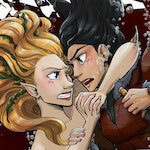 Can Meela overcome her feelings for one of the mermaids she was trained to kill? Join Meela and her crew as they embark on the Massacre in this webcomic adaptation of Tiana Warner's award-winning Mermaids of Eriana Kwai trilogy. Oooh, I recognize the art style, you work for the prince and swan too ? You're doing a great job, you got my sub! !